The Forum is excited to welcome our newest Policy Analyst, Ashley Kazouh. As a Policy Analyst, Ashley supports the policy team by monitoring, documenting, and providing analysis of current education policy issues in North Carolina. Prior to joining the Forum, Ashley earned a B.A. in Psychology from Wake Forest University. After college, she gained a passion for education and racial equity through influential experiences such as facilitating social justice workshops for students as an Americorps member in Memphis, TN and collaborating with community members to promote the academic, socio-emotional and behavioral well-being of students as a Program Coordinator at Big Brothers Big Sisters. Ashley is completing dual masters’ degrees in Social Work and Public Administration at UNC-Chapel Hill, where she has gained a multitude of research experience. Her interests are largely focused around the intersection of racial equity, education policy, and nonprofit leadership. Ashley grew up in High Point, North Carolina. We can’t wait to see so many of you on Wednesday, but if you can’t be there, look for the Top 10 Education Issues 2019 publication release on our website next Wednesday, the panel discussion on Education Matters next weekend and the full event video soon. 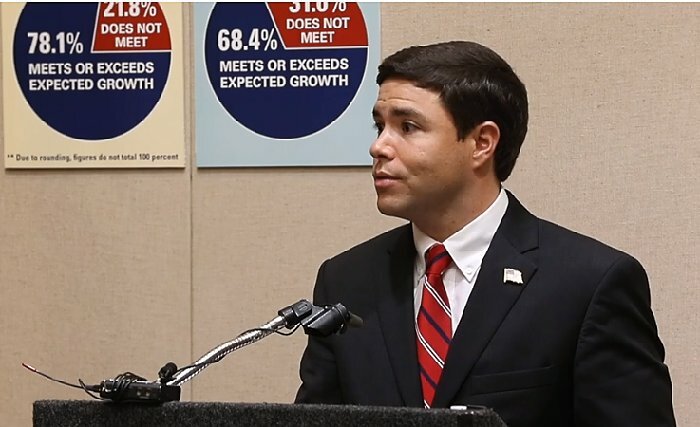 Mark Johnson, North Carolina Superintendent of Public Instruction comments on the annual release of the school performance grades during a press conference at the State Education Building on Wednesday, September 5, 2018 in Raleigh, N.C. Photo Credit: Robert Willett, The News & Observer. Some of North Carolina’s high-stakes standardized student tests are about to get shorter, and schools may not have to scramble looking for people to proctor the exams anymore. State Schools Superintendent Mark Johnson has announced several changes that the state Department of Public Instruction will make for testing this school year that he says should reduce the amount of stress on students and teachers. Changes include state exams with fewer questions, allowing students to leave the exams sooner and easing rules requiring exam proctors. Hui, K. and Doss Helms, A. “‘Testing in NC schools could get less stressful. Changes in exam rules are coming.” The News & Observer. 1/16/19. State Superintendent Mark Johnson has announced plans to reduce standardized testing in public schools. 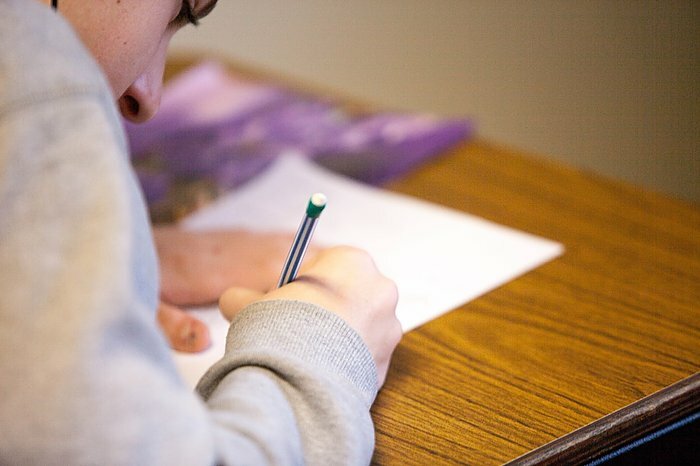 Proponents of more standardized testing believe it enforces accountability for students and teachers while creating standards to track performance; however, detractors believe it encourages teachers to create lesson plans geared towards exams while discouraging students from pursuing subjects they won’t be tested on. 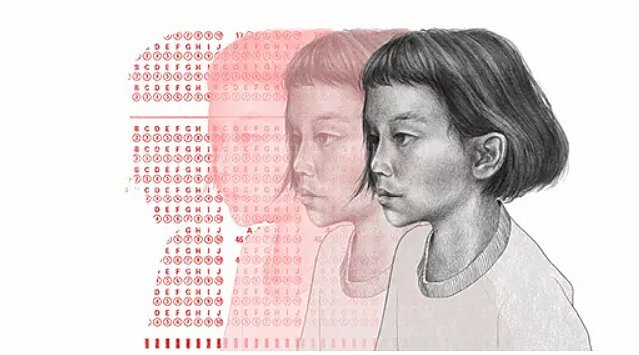 “If Mandarin Chinese is not going to be on the standardized test at the end of the year, do those kinds of classes that are really important for a great world-class education, are they dropped in favor of check-in-the-boxes?” asked Keith Poston, the parent of a public school graduate and the President and Executive Director of the Raleigh-based non-profit Public School Forum of North Carolina. Perchick, M. “State Superintendent calls for fewer standardized tests.” ABC 11. 1/16/19. Lynn Makor, DPI’s school psychology consultant, shares how support personnel work in teams to support the health of students. Photo Credit: Liz Bell, EducationNC. Student success has to do with more than academic instruction and performance. School support personnel provide much-needed services to address other factors of the “whole child” — physical, social, and behavioral health and wellbeing. Yet in schools across North Carolina, these “specialized instructional support personnel” (SISP) are stretched thin. 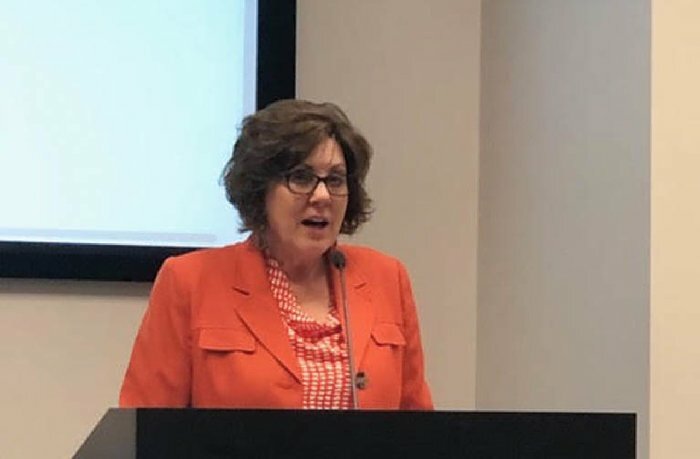 In presentations from school nurses, psychologists, social workers, and counselors, the Governor’s Access to Sound Basic Education heard Thursday of the barriers facing SISPs’ work. 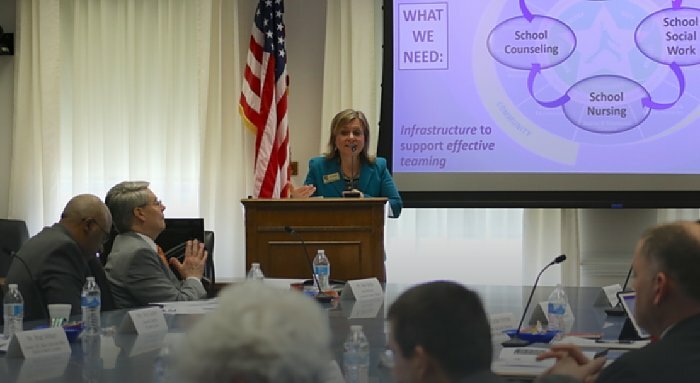 Bell, L. “Governor’s Leandro commission looks at North Carolina’s school support personnel.” EducationNC. 1/18/19. Governor Roy Cooper was in the Queen City Tuesday, making a big announcement for education. While meeting with students and staff at Parkside Elementary School in north Charlotte, the governor announced he is re-proposing a $2 billion new school construction bond. Governor Cooper says he first proposed the bond last year, but says it was squashed by members of the General Assembly. With a new assembly now in place, and his veto power back, the governor is hoping to finally get it passed. Daley, A. “Governor Cooper visits Charlotte, announces bond proposal.” WCNC. 1/15/19. Prominent North Carolina CEOs gathered for a press conference to discuss the importance of increasing participation in NC Pre-K to 75 percent of eligible children, at Millbrook Elementary School in Raleigh on Thursday, Jan. 17. Photo Credit: Casey Toth, The News & Observer. 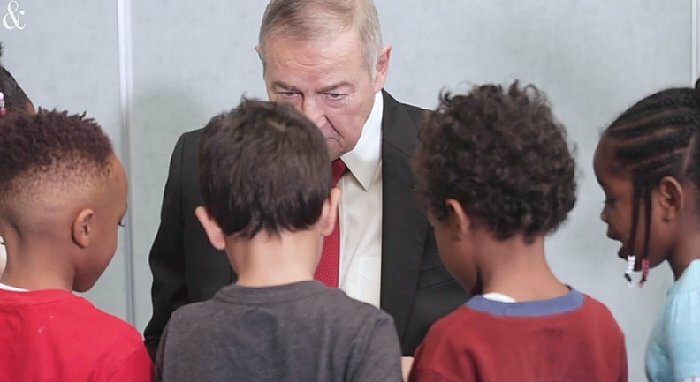 Prominent North Carolina business leaders are calling on state leaders to sharply increase pre-kindergarten enrollment by more than 15,000 children so that 75 percent of the eligible children are served. Hui, K. “Business leaders say NC must do more to provide Pre-K to those kids who most need it.” The News & Observer. 1/17/19. Lynn Moody, school superintendent, presents a 12-point plan to identify renewal paths for schools. Photo Credit: Maggie Blackwell, EducationNC. The Rowan-Salisbury School Board met on Monday and key among their agenda items was a presentation by School Superintendent Lynn Moody on the Renewal implementation process. Rowan-Salisbury Schools was approved as a Renewal District by the General Assembly in 2018 for a five-year term, effective immediately upon approval. 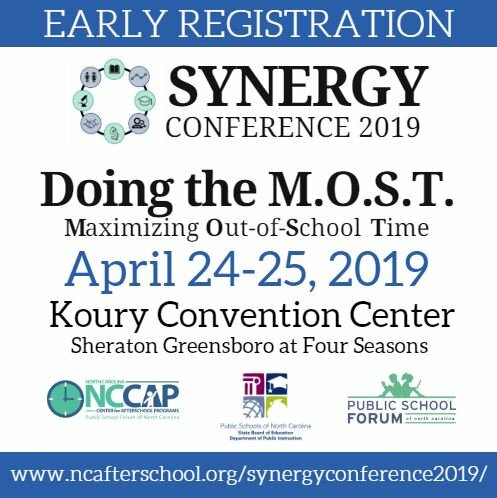 Renewal status gives the system charter-like flexibility to meet the needs of each school’s population in distinct fashions, while still meeting core state requirements, such as student absenteeism, annual state testing requirements and outcomes, and teacher and administrator turnover. While the system does not receive additional funding in Renewal status, it does have more lenience in how to utilize its existing funding. Blackwell, M. “Rowan-Salisbury assesses way forward on Renewal.” EducationNC. 1/16/19. 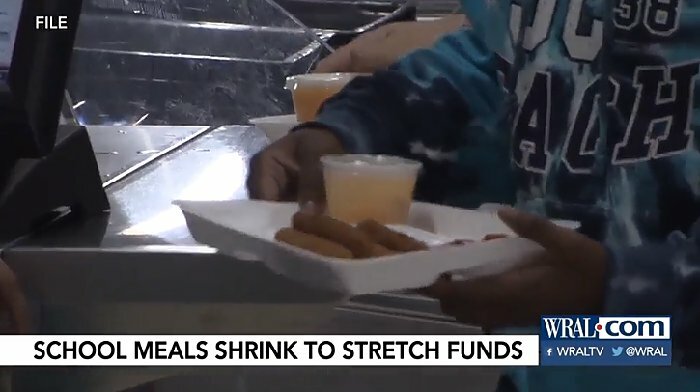 Vance County Schools will start serving “minimum-level” lunches next week because of the partial government shutdown, district officials have announced. Starting Monday, Vance schools will offer one main dish, bread, two vegetables and milk. The county’s public schools will not offer fresh produce except at elementary schools, where produce will be offered twice a week, according to the district’s plan. Krueger, S. “Federal shutdown prompts changes to Vance school district lunch program.” WRAL. 1/16/19. N.C. Rep. Ray Russell (D-Boone), left, and N.C. Sen. Deanna Ballard (R-Blowing Rock), right. Photo Credit: File photo, Watauga Democrat. As one of the freshman representatives in the North Carolina General Assembly, Ray Russell has been trying to familiarize himself with the ins and outs of legislative offices in downtown Raleigh. From moving into his new office, to participating in workshops and meeting some of his fellow elected officials, Russell has been gearing up for two years of law making. Sherrill, T. “Education, health care are main goals of Russell, Ballard going into 2019.” Watauga Democrat. 1/16/19. Gov. Cooper talks legislative priorities with his teacher advisory committee. Photo Credit: Rupen Fofaria, EducationNC. 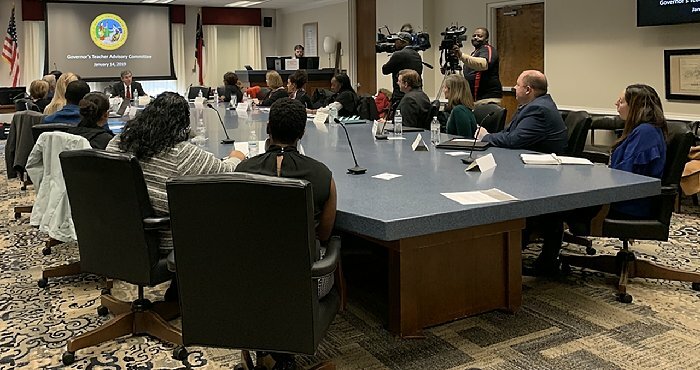 Governor Roy Cooper met with the Governor’s Teacher Advisory Committee yesterday to talk about some of his priorities ahead of the 2019-2020 legislative long session. In its second year after he established the committee with Executive Order No. 16 in August 2017, the committee continues to serve as his eyes and ears in the classrooms and advises him on education issues. The committee meets quarterly, and independently in smaller breakout committees, as they finalize strategic plans to present to Gov. Cooper. Fofaria, R. “Governor Cooper addresses the Governor’s Teacher Advisory Committee.” EducationNC. 1/15/19. Marissa McOmber teaches her seventh-grade class at Hairston Middle. Photo Credit: Khadejeh Nikouyeh, News & Record. As a multi-classroom leader working with nine English teachers, Ekwem-Thorpe is part of a new experiment for Guilford County Schools — one that rearranges some school staffing roles in an attempt to boost student achievement. Pounds, J. “Guilford County system tries new approach to help students at struggling schools.” News & Record. 1/14/19. 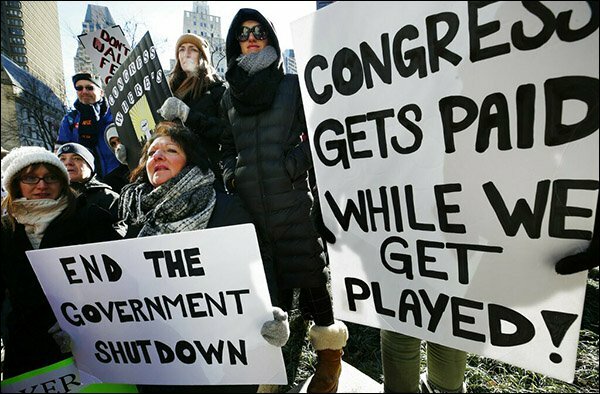 More than three weeks into what’s now the longest federal government shutdown in history, school district officials are making plans to cope with the impacts on students, families, and their own operations should it drag on. Superville, D. “How the Shutdown Is Starting to Impact Schools.” Education Week. 1/13/19. Educators do not like the annual statewide tests: They inform school penalties, not learning, because the results come so late in the school year. They fail to match any specific curriculum, and generally don’t deeply measure students’ analytical capabilities or the dispositions employers and colleges value. Sawchuk, S. “Is It Time to Kill Annual Testing?” Education Week. 1/8/19. 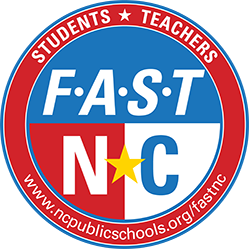 Our NC Resilience & Learning Project is hosting a webinar on Tuesday, January 22nd at 4 pm for all school staff on what to do in the aftermath of a natural disaster to support families and reduce trauma. With hurricanes and floods often hitting our coastline and other natural disasters that can occur across the state that impact our schools and families, we know this is an important topic for school staff. 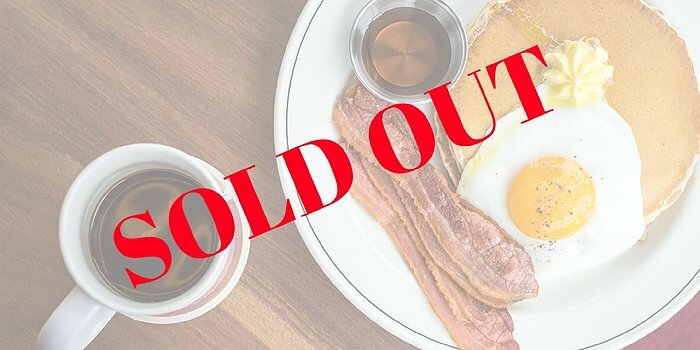 Please join us live on Tuesday using the following link: https://zoom.us/j/894881529. A recording of the webinar will be available online at https://www.ncforum.org/north-carolina-resilience-and-learning-project/. 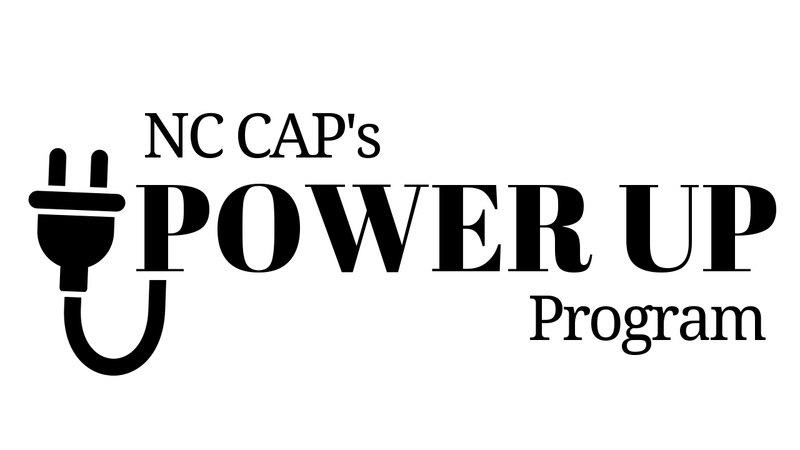 Applications for NC CAP’s POWER UP Program are due by January 14th and can be submitted here.